Peter Paul Rubens (1577–1640), Minerva Protects Pax from Mars (Peace and War) (detail) (1629-30), oil on canvas, 203.5 × 298 cm, The National Gallery (Presented by the Duke of Sutherland, 1828), London. Image courtesy of and © The National Gallery. Seventeenth century Europe was ravaged by war. Between 1618 and 1648, much of what is now Germany suffered the Thirty Years’ War, with widespread famines, epidemic disease, and the fighting itself. This spilled over to the Netherlands and Belgium, and beyond. Warfare at that time used weapons which individually had limited killing power, but wherever there was war, largely mercenary armies stripped the whole area of food and supplies, laying waste to large tracts of countryside, and bringing infectious diseases which then killed many of the local population. In the midst of that, some of the old Masters managed to flourish, among them Peter Paul Rubens (1577–1640), arguably the greatest narrative painter in Western art, and an accomplished international diplomat. Rubens was no stranger to the consequences of religious persecution, conflict, and war. His Protestant parents had fled Antwerp for Cologne before his birth, he returned to Antwerp with his widowed mother in 1589 to be raised as a Catholic, and from 1600 he travelled throughout Europe, including Italy, Spain, France, England, and the Low Countries. In 1629, he returned from a period in Madrid, where he had worked with Diego Velázquez, spent a little time back in his workshop in Antwerp, then travelled to London, where he stayed until April 1630. A relatively peaceful country during the war on the continent of Europe, England’s stable period during Queen Elizabeth I’s reign had ended with her death in 1603; two years later Guy Fawkes and conspirators had tried to blow up the House of Parliament, and the Civil War broke out in 1642. Rubens was now in his early fifties, internationally successful, and able to choose his own motifs rather more. He had developed his own sophisticated visual language of narrative over three decades of painting stories. Acting as envoy to King Philip IV of Spain, he was trying to agree peace between Spain and King Charles I of England. Among his tools was one of his greatest narrative paintings, Minerva Protects Pax from Mars or Peace and War, which he painted when in England and left as a gift to its king. Peter Paul Rubens (1577–1640), Minerva Protects Pax from Mars (Peace and War) (1629-30), oil on canvas, 203.5 × 298 cm, The National Gallery (Presented by the Duke of Sutherland, 1828), London. Image courtesy of and © The National Gallery. Rubens’ painting, now in the National Gallery in London, is crowded with over a dozen figures drawn from classical myths. Until you have identified them and understood their roles and meaning, its story remains elusive. Its central figures are those of Ceres, here in the role of Pax (the personification of peace), and Minerva, behind her. In attendance are Mars, Hymen, Plutus, and Alecto, with sundry Bacchantes, a Satyr, putti, and the attributes of Bacchus and Mercury. It’s like an away day from Olympus, or part of an index to Ovid. Ceres and Minerva are at the heart of the painting. 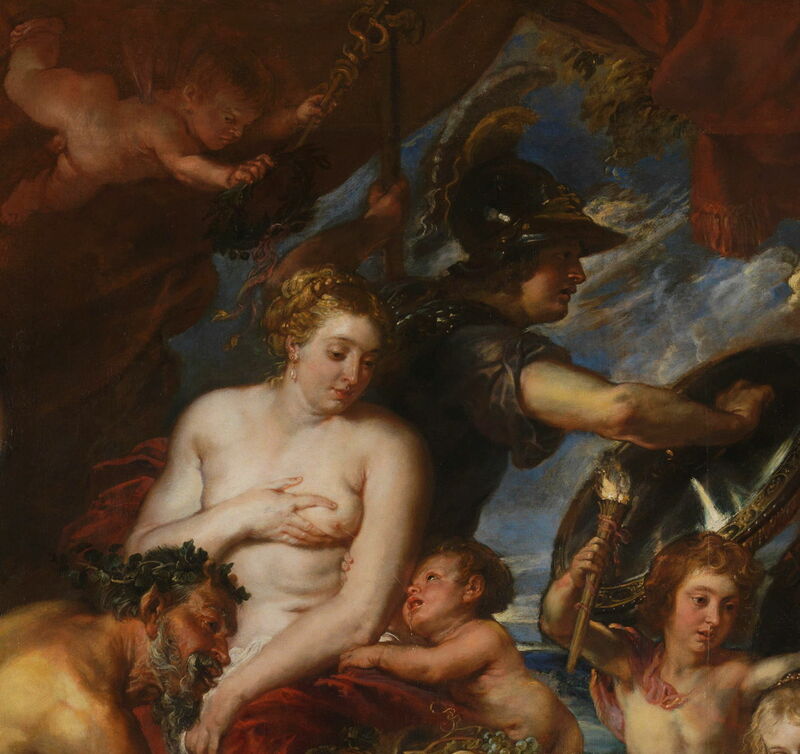 Rubens shows Ceres expressing milk from her left breast, which arcs into the mouth of her son Plutus, the god of wealth, who is grasping her left arm. Peter Paul Rubens (1577–1640), Venus, Mars and Cupid, oil on canvas, 195.2 × 133 cm, Dulwich Picture Gallery, London. Wikimedia Commons. The figures of Ceres and Plutus are almost identical to those of Venus and Cupid in Rubens’ earlier Venus, Mars and Cupid (c 1633), which introduces ambiguity to her figure. However, in this painting Cupid is shown with wings, and his traditional bow and arrows. In Peace and War, the infant is clearly not Cupid as he has neither wings nor bow and arrows: he is Plutus there. Being the goddess of agriculture, grain crops (hence cereal), and maternal relationships, Ceres stands for values which are strongly associated with the benefits of peace – bread rather than starvation, fertility rather than barrenness and pestilence. Her son Plutus represents the growth of wealth during times of peace. Although the figure immediately behind Ceres might be mistaken for a man (hence Mars, perhaps), her staff and helmet are characteristic of Minerva, the goddess with a curious mixed portfolio of wisdom, industry, and war (a hangover from her part-Etruscan origins). Immediately above her is a winged putto carrying a caduceus, a short staff with wings at the top and entwined snakes, normally an attributed of Mercury, but also associated with commerce. (The rod of Asculepius has no wings, and but a single snake.) That putto leans forward to place a laurel wreath, the crown of the victor and a symbol of peace, on Ceres’ head. Minerva is pushing away the bearded figure of Mars, the god of war, who also wears his characteristic black armour. Rubens painted Mars not infrequently, and was very flexible over his age and appearance, which vary according to context. With Venus and Cupid above, he is a young, clean-shaven man. Peter Paul Rubens (1577–1640), Venus and Mars (1632-35), oil, 133 x 142 cm, Musei di Strada Nuova, Genoa, Italy. Wikimedia Commons. In Venus and Mars (1632-35) he appears more like an ageing general than a warrior, and Venus is past the beauty of her youth too. Perhaps they had succumbed too often to the temptations of Bacchus, seen brandishing an empty glass behind. At the far right of Peace and War is Alecto, the Fury responsible for dealing with the moral offences of humans, usually by driving them mad. Rubens refrains from giving her snakes in her hair, but lays emphasis on madness – the madness of war. On the opposite (left) side of the painting is a Bacchante holding her tambourine (tympanum) aloft, and another bearing earthly riches at her left side. A Satyr crouches low over a leopard, and proffers a cornucopia filled with fruit to the figures at the right. This group is associated with Bacchus. Although he is not himself present, his chariot is normally drawn by leopards (or similar big cats), and he is accompanied by Bacchantes. 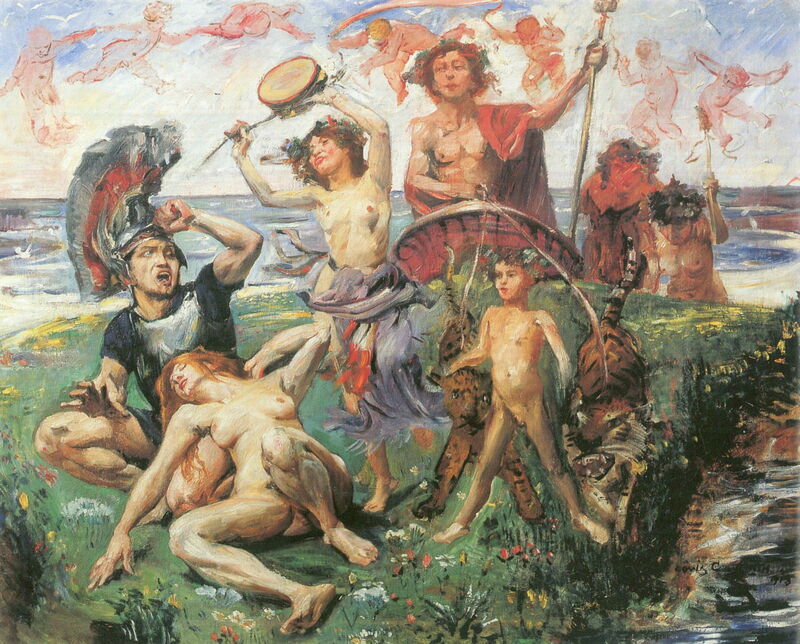 This is shown well in Lovis Corinth’s marvellous painting of Ariadne on Naxos (1913) below. Bacchus’ age and appearance are remarkably variable. 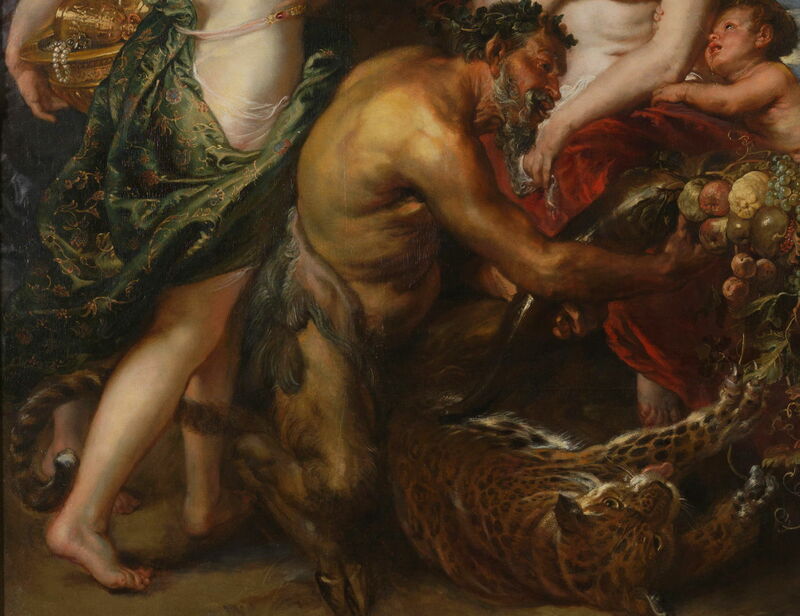 In Ruben’s later Bacchus (1638-40), he is old and grotesquely obese, but still accompanied by his big cats. Peter Paul Rubens (1577–1640), Bacchus (1638-40), oil on canvas transferred from panel, 191 × 161.3 cm, Hermitage Museum Государственный Эрмитаж, Saint Petersburg, Russia. Wikimedia Commons. 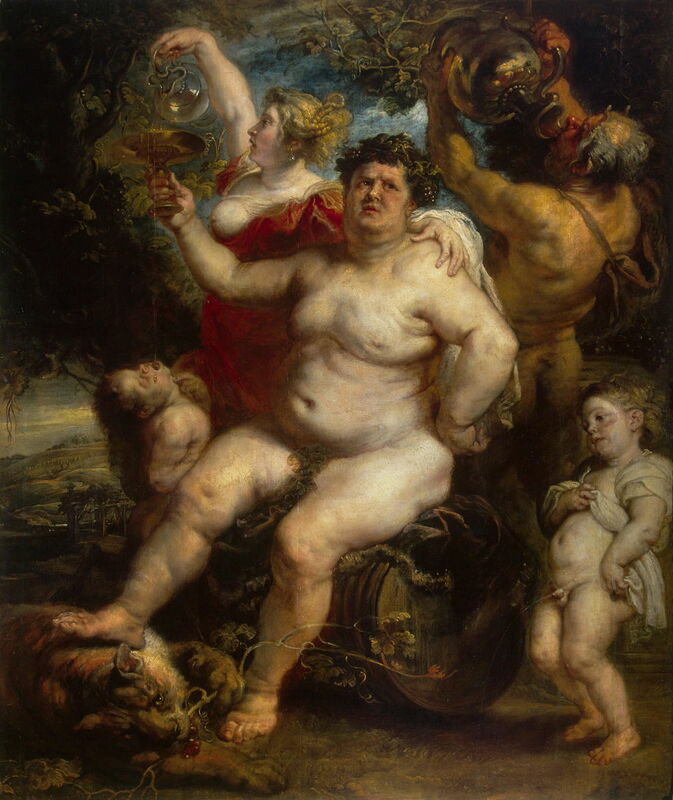 This painting was completed not long before Rubens’ death from the consequences of gout, and may be the artist’s personal reflection on the result of sustained familiarity with Bacchus. On the other side of the cornucopia from the Satyr is a small group of children, and a winged putto or Cupid, led by Hymen, who bears his characteristic torch. The god of marriage has led the products of marriage to the fruit of peace and plenty. These figures were painted from the children of one of King Charles’ diplomats, Sir Balthasar Gerbier, who was both an artist and Rubens’ host while he was in England. 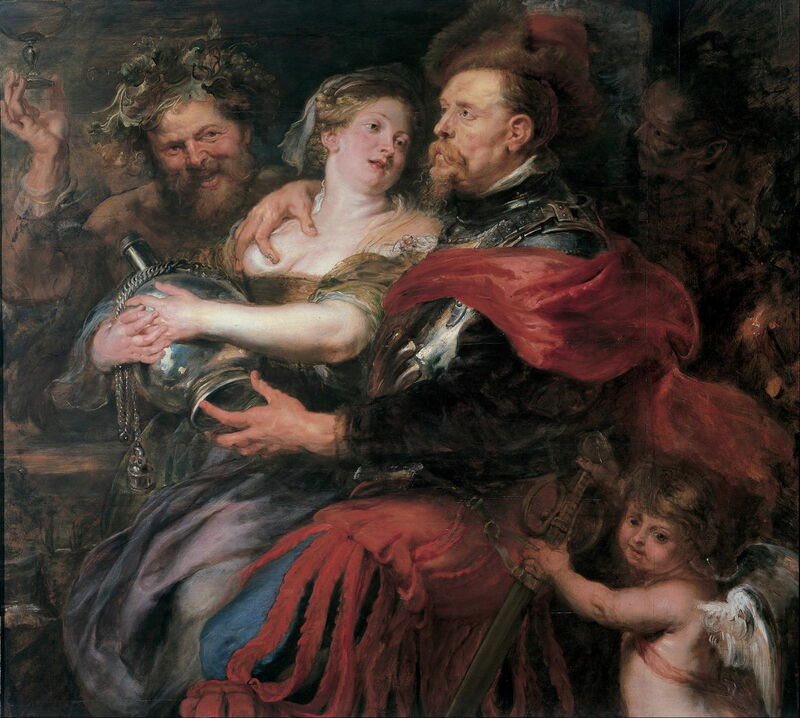 Rubens’ story is clear: push war and its associated madness away, and you will enjoy peace, prosperity, and a thriving, well-nourished population. King Charles made peace with France and Spain, but could not get on with his own parliament; he therefore ruled England without a parliament for the “eleven years’ tyranny”. Collapse of power was inevitable after that: he faced Scottish and Irish rebellions, then in 1642 found himself in a civil war. He was executed on 30 January 1649. 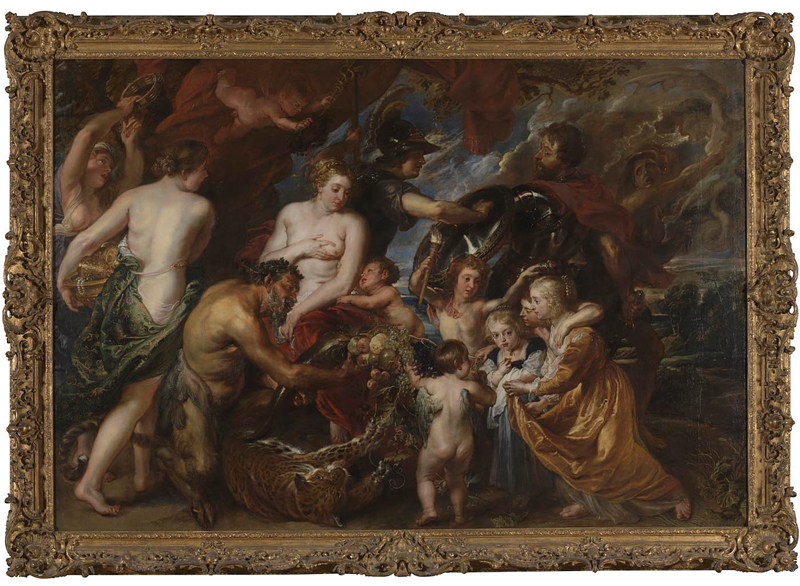 Rubens returned to Antwerp in 1630, where he painted a second masterpiece on the subject of peace and war, which I will examine in the next article. Posted in General, Life, Painting and tagged Ceres, Mars, myth, narrative, painting, Rubens, Titian, Velázquez. Bookmark the permalink.